Alt-left advocates for net neutrality, who say they want a "free and open internet," want to ban the Drudge Report. Members of the alt-left who have been tied to violent protests in the past picketed outside the Federal Communications Commission on Thursday in protest of Chairman Ajit Pai's proposal to reverse net neutrality rules. The FCC will vote to undo the Obama era Title II rule that classified Internet service providers as utilities, subjecting them to more federal regulation. 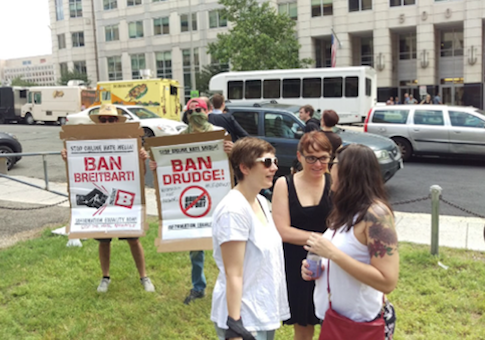 Protesters covering their faces held signs that read "Ban Drudge," with a no symbol over the Drudge Report, the highly trafficked news website run by Matt Drudge. 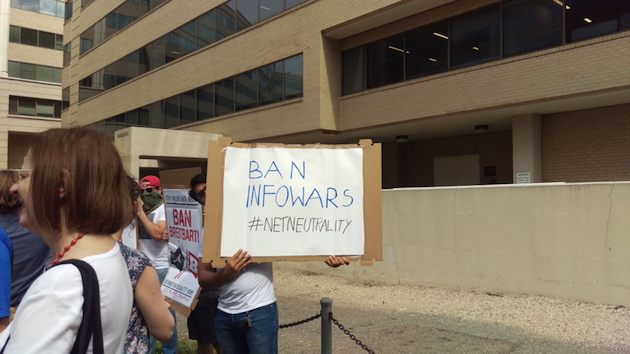 Other protesters held signs to ban other news websites, including Breitbart and InfoWars. Organizers of the campaign "Protect Our Internet" are connected to PopularResistance.org, which features several members of the antifascist (antifa) campaign. Protect Our Internet claims its mission is to "keep the internet vibrant, free and equal." The campaign also claims net neutrality rules are "protecting our freedom to use the internet!" A report released this week found that net neutrality regulations lead to higher internet prices for consumers and less innovation.